Alejandro Pena-Esclusa (APE) is a Venezuelan politician, two times presidential candidate whose ideology and principles ruling his struggle are expressed in his extensive written work published on his NGO website Fuerza Solidaria (www.fuerzasolidaria.org) . He is a renowned international lecturer against the violent forms of struggling and resolving conflicts, characteristic of terrorist organizations that have scourged Latin America, for considering them cruel, unfair and inefficient means. The case of Colombia has been an issue that has occupied much of his agenda. He has posited an alternative to the socialist governments of the region grouped in the Sao Paulo Forum  founded on transcendent principles and values that are expressed in two of his works: “The Continent of Hope” (in English, Spanish and Portuguese) and “Classical Art and good government” . At international level, he formed UnoAmerica , an organization having as purpose “developing and offering the peoples of America, a development and industrialization program to solve the region’s fundamental problems, particularly that of poverty, as a true antidote to totalitarianism”. persecuting his most relevant political opponents, imprisoning them, exiling them or politically disqualifying them by means of administrative chicanery. Dr. Pena-Esclusa was the first to accuse Chavez (2000) of betraying his country before the Venezuelan Attorney General Office, and latter acussed him at the Inter-American Commission on Human Rights (IACHR) for promoting violence in Latin America. At the time of his arrest, Dr. Pena-Esclusa was leading an international team to accuse Chavez before the International Criminal Court for crimes committed against humanity deriving from Chavez ties to the FARC. Pena-Esclusa has spread out his struggle in different countries of Latin America, the most recent episode being Honduras, when President Zelaya, an ally of the Sao Paulo Forum, was dismissed by the Honduran Congress when seeking to violate a stone rule of the Constitution expressly prohibiting indefinite reelection, a strategy initiated in Venezuela to ensure Zelaya’s long stay in power. Pena-Esclusa then helped to achieve a peaceful and democratic solution that ended in President Porfirio Lobo’s election, all of which constituted the “straw that broke the camel’s back” and determined his political persecution and imprisonment, that he now serves, as Chávez political prisoner. 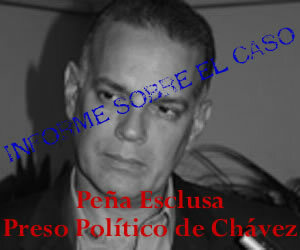 Ironically, Pena-Esclusa has been involved in a terrorism case (that against he has struggled all his life) being accused of two types of crimes provided for on the Law Against Organized Crime in Venezuela (LCDO): conspiracy (Article 2 ordinal 1, in conjunction with Article 6 of the LCDO) and concealment of weapons of war (Article 9 of the LCDO). http://fuerzasolidaria.org/?p=4073, which includes Court records, videos, documents and answers to frequently asked questions. To prove this offense, the prosecution based its charges on a police report (Appendix A) signed by the official in charge of the Counterintelligence Directorship of SEBIN (Bolivarian Nactional Intelligence Service), David Colmenares, according to which Francisco Chavez-Abarca, a Salvadoran citizen arrested at Caracas International Airport for (presumably) carrying a fake passport, (supposedly) declared his desire to “cooperate” with the Venezuelan authorities to avoid being deported to Cuba. Using a fake witness has been the trend widely used by the Governments members of ALBA and the Sao Paulo Forum, to render media declarations which are vastly exploited, against oposition leaders such as Pena-Esclusa, and suddenly become invisible because they either disappear or, in the case of the alleged terrorist Francisco Chavez-Abarca, has been flown to Cuba and is jailed for supposedly act to commit conspiracy against the Cuban and Venezuelan Governments. It is important to mention that Francisco Chavez-Abarca’s wife is known to be at an unknown location in El Salvador, Central America. That was the only “piece of evidence” the prosecution had. The Justice Department never interviewed Chávez Abarca and the defense never had access to him. He was promptly deported to Cuba where he is allegedly serving a sentence of thirty years imprisonment. The Public Prosecutor did not promote its testimony. The defense, however, DID SO being absolutely sure that Dr. Pena-Esclusa had never known this person. And unusually, the judge DISMISSED such evidence of the defense, being this person who started the investigation and Pena-Esclusa’s alleged “partner”, all though the existence of an AGREEMENT BETWEEN THE GOVERNMENT OF THE REPUBLIC OF VENEZUELA AND THE GOVERNMENT OF THE REPUBLIC OF CUBA ON LEGAL ASSISTANCE IN CRIMINAL MATTERS  by virtue of which (Article 1, Paragraph E) Chavez-Abarca could have been transferred to Venezuela in order render a statement. In short: a police report signed by an official of the regime, not signed by the alleged respondent (conditio sine qua non for its validity) was sufficient for the prosecution to impute this crime and for the judge to admit the charge in a clear violation of due process, as provided for in Article 49 of the Constitution of Venezuela. With that Police Report (Annex A) and without any research effort, the Justice Department ordered the raid of Pena-Esclusa’s home. The public opinion was already aware of the government’s intention to involve Pena-Esclusa with Chávez Abarca, and the day before the raid, the newspaper “La Razon” warned of such possibility. a) UNAUTHORIZED officials made presence at Pena-Esclusa’s home, which, by itself, makes the procedure void. c) Upon entering the home, they proceeded to handcuff Dr. Pena-Esclusa and confined him in a corner of the entrance room of the house, unable to supervise the procedure and violating the constitutional principle of “presumption of innocence” and the legal right to be treated as such. d) They also confined his wife and his three young daughters in the master bedroom, also prevented from monitoring the procedure, all in clear violation of the “rules of policing” that require the presence of those being investigated in the areas being reviewed. e) They came with two (2) witnesses brought by the task force that performed the raid, despite the Venezuelan Criminal Procedure Code gives priority to the raided party’s neighbors, many of whom were present. It was so that after “collecting” computers, cell phones, pen drives, documents, photos and other electronic equipment for household use, the commission that performed the raid said they had “found” scattered in different places, including in Pena-Esclusa’s youngest daughter’s (8 years) desktop suspected explosive detonators and C-4 loaves. Interestingly, none of that was in the main room and in the entrance hall, where the husbands were. Away from the spouses’ presence, supposed “orientation tests” were made in which “presumed” C-4 loaves were found and then, without control from the raided party or lawyers or experts, the same official who performed the “Orientation Test” made an alleged expertise at the SEBIN in order to “conclude” that it was about explosives. In short, there is no way to determine if what they said they found at Dr. Pena-Esclusa’s home was explosive material and if it was the same substance upon which the SEBIN conducted the expertise. This meaning, that no possibility of control and supervision at all (violating the “principle of evidence control and contradiction” in criminal proceedings) to Pena-Esclusa was attributed (who was adequately and timely warned of the raid) the fact of having “hidden” this dangerous material in the kitchen, her daughter’s desk and scattered elsewhere in his home, other than where he and his wife were being held. This crude, clumsy and unacceptable maneuver was used for accusing an open opponent of the Venezuelan regime for these two serious offenses. At the time of writing this report, Pena-Esclusa remains for more than seven months deprived of his right to freedom and work. Finally, the Pena-Esclusa case has raised many protests of personalities from all over the world, including that of twenty-three (23) European parliamentarians, the opposition bloc of the Congress of Bolivia, the Chairwoman of the Committee on Foreign Affairs of the United States Congress, the Governor of the State of Alabama, and the Vice Governor of the State of Sao Paulo, Brazil. Other institutions have also pronounced themselves, such as the Inter-American Institute, the Association for Justice and Harmony (grouping 400 Argentinean lawyers), the Brazilian Academy of Philosophy (of which Dr. Pena-Esclusa is a member), the Association B’Nai Brith of Rio de Janeiro (grouping Jewish communities in that city), the Civic Democratic Union of Honduras, the Convergence Party of Spain, the One Million Voices Against the FARC Foundation, the Colombia Truth Federation, as well as academics, parliamentarians, politicians, intellectuals and prelates of Latin American, the U.S. and Europe. In this website of Fuerza Solidaria you may find articles, books and videos of free distribution, wherein the motivations, ideology and the organization and his main leader Alejandro Pena-Esclusa’s proposals are issued.